In 1953, Howard Harper sailed with his friend, Colin Blair, from New Zealand to Pakistan. Shortly after that, with little money in his pocket and no confirmed place in medical school, Howard boarded a plane to London to commence medical studies. After qualifying as a doctor and marrying Monika, Howard made his way back to Pakistan, overland with a caravan in tow. His medical skills opened the door to service in Afghanistan. In the mid 1960s Howard and his young family moved to Kabul to pioneer a medical program involving work with the blind and relief aid. This story is told by Howard's daughter, Faith, in From Kabul with Love. 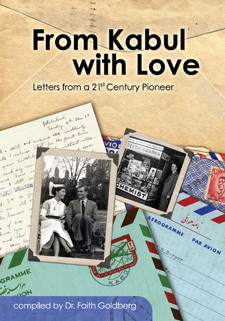 Using letters sent between Howard and his father, Stan, she has pieced together an authentic account of how a young man from New Zealand accomplished extraordinary things. Personal and moving, From Kabul with Love is a unique insight into the life of one of New Zealand's unsung heroes. Since publication of this book, Howard has been awarded the 2010 Augusta Award and the 2011 KEA Supreme Award at the World Class New Zealand Awards. "I found the correspondence inspiring and moving and also extremely informative." "...this is great reading for anyone interested in mission and the reality of fulfilling the vision." "Harper is one of New Zealand's least-known but most impressive sons." "These many letters, from son to father, from daughter-in-law to father-in-law and from father to both or either are most absorbing. In fact I would not have thought, prior to reading this book, that I would be so gripped by what was recorded in them. The reader is privileged to be able to share in these intimate insights... This is an unusual and fascinating read..."
Faith Goldberg is Howard Harper's second daughter. She has lived in Pakistan, Afghanistan, Iran, England, Uzbekistan and, for the past 20 years, in Israel. Faith met her husband, Jonathan, in Israel after completing her medical studies in England. She worked at St John's hospital, an eye hospital in East Jerusalem that serves the West Bank and Gaza strip. Later, Faith and Jonathan took their young family to Uzbekistan to help Howard establish an eye clinic. After two years they returned to Israel to take up leadership of the Operation Mobilization team there. It was a personal search for identity that propelled her to investigate her family roots more deeply and compile From Kabul with Love. Faith is editor of the magazine The Hope of Israel.